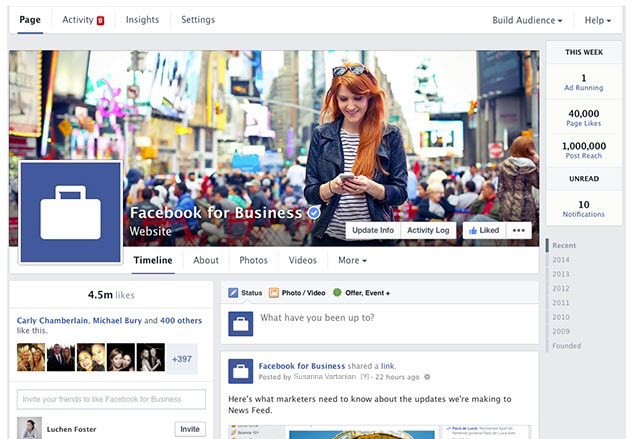 Starting the week of March 10, 2014, Facebook started rolling out a new layout for pages. They claim the new layout will be more streamlined,making it easier for fans to find the information they’re looking for on your page and also making it easier for page admins to access the tools they use the most. Behold, the new(est) Facebook page layout! Screenshot from here. 1. New Timeline Design: The left column of the page will have your business information that was previously tucked up under your cover photo. Tabs as we know them will be gone and replaced with simpler text-only tabs located below the cover photo. Your timeline will once again be a single column with posts showing up chronologically and all in one place (versus the current setup showing just highlights). 2. Easy Access to Admin Tools: Facebook is adding a “This Week” panel to the right of your cover photo that will give you a basic overview of your page stats and more detailed stats by clicking on the panel. There will also be admin navigation tabs above the cover photo for quick access to the tools you use as well as direct access to your Ads Manager page. 3. Pages to Watch Update: If you haven’t set up your pages to watch, it’s a great feature to keep tabs on what pages of your choosing are up to and how well they’re performing. With this update, the overview tab will show key stats and the posts tab will show the pages’ most engaging posts. Page admins will be notified when their page is added to another page’s watch list, but Facebook does not reveal which page added it so you can do so anonymously. 4. Messages: Messages will now be accessed through the Activity navigation tab above the cover photo as well as through the “This Week” panel. 5. Expanded Content Section: Where before, fans had to click on the small tabs below the cover photo to access your photo album, video, notes and other content, all of this will be expanded and displayed down the left column of the timeline to show more content and make it easier for your fans to view and access the content you want to share. Content will still be available through the text-only tabs under the cover photo, but the expanded view allows for a much more attractive page display. How do I get the new layout? On your page, there may be a section just below the Admin Panel and above the cover photo that looks similar to the section below. Click on Join Waitlist to get added. There’s no word yet on how long it will take to get added, but joining the wait list should improve your chances of getting the new layout sooner rather than later. Click it! You know you want to! For more information and detailed page preview screenshots, see Facebook’s news page.